I love when Olbermann calls out others for diversity. Especially when its an organization that hires minorities. Like the Diamondbacks, who were nearly half non-Caucasian. Maybe New York should enact immigration reform at 30 Rockefeller Plaza. If Keith truly believes in the progressive concept of diversity, he should immediately quit MSNBC, which has skipped on numerous opportunities to hire minorities for their shows over the last three years. All day, all night, all white!! Miguel Montero is an excellent candidate to be an All-Star catcher. An early season injury messed up his ’10 start, but he’s one of the top catchers in the NL, behind only McCann & having Soto, Martin & Doumit being close peers. Odds are, most feel he’s the #2 NL catcher. 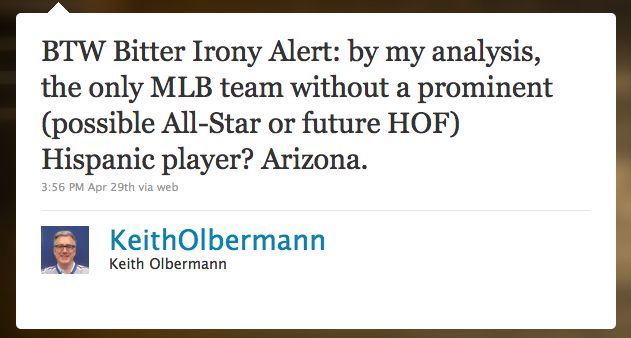 Methinks Olbermann was looking only at the latest D’backs lineup, forgetting Montero since he’s been hurt for a month. A true baseball fan would know that, though.